After nearly 35 years serving the public works industry with Falls Snowplows, Jim Owens is set to retire at the end of the year. I got to know Jim buying some of my first snowplows as a Public Works Director 20 years ago. Jim’s charismatic style and his passion for what he does was always memorable to me and others in the industry. During his time at Falls Snowplows, Jim covered 10 states; a portion of Canada; and sold snowplows in China, Argentina, Bolivia and even Florida. Florida??? Really Jim? Aside from his role at Falls Snowplows, Jim has been an active member in APWA both at a national and local level since joining in 1986. Not only has Jim participated in numerous national and chapter conferences over the years, but he has also served as a Director on the Chapter’s Executive Committee, served as a committee member on the Chapter membership committee, served on the APWA Exhibitors Advisory Council, and was selected to serve on the APWA Site Selection Committee. All of this culminated with Jim’s national award in 2016 where he was selected for the Presidential Leadership Award. 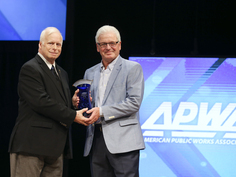 One of the most sought-after awards in APWA. Jim is one of those guys you will always remember and someone who brought energy to our Chapter and the profession. Please join me in wishing Jim the best as he enters retirement!